Yuma County is the fourth largest gold producer in Arizona and has a rich history of gold mining that dates back to the 1850s. The area around Yuma has unique geographical features made up of mountains and rivers that have been influential in its gold mining. The geological makeup of the desert region around Yuma is mainly gneiss, schist and granite rocks from the Precambrian age, metamorphic and sedimentary rocks of the Paleozoic age and volcanic rocks of the quaternary age among others. Yuma has had lots of gold mines and mining regions that have made a significant contribution to the total gold production of southwestern Arizona. 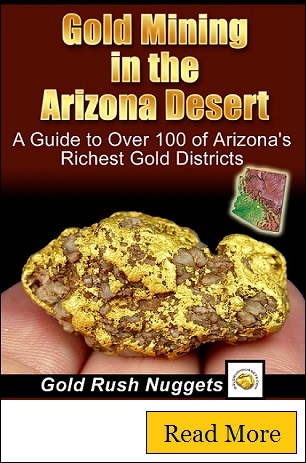 When prospecting for gold around Yuma then you should consider visiting some of its historical gold producing regions. Lots of successful gold miners are still using metal detectors to recover gold from the desert washes in this part of the Arizona desert. Here are a few general locations you should focus on. The Castle Dome Mountains has produced a considerable amount of both placer and lode gold over the years. The first gold discovery in the mountains was in the 1870s and most of the early mining was small placer mining operations in creeks using simple tools such as sluice boxes. The major commercial gold mining did not start until 1912 when a lead ore that also contained silver and gold was discovered. It is estimated that several hundred thousand gold ounces have been mined from the Castle Dome Mountains. The most notable gold producing mine in the mountain is the Big Eye Mine. Gold was discovered in the Gila Mountains near Yuma in 1858. This brought in thousands of prospectors who mined placer gold in the desert washes throughout the mountains. This led to the growth of the Gila City which became the center of supplies for the miners. Some of the richest mines included the Monitor Gulch which produced some valuable gold over the years. This is still a good area to try metal detecting for gold nuggets. Drywashers are also productive if you can locate a rich gold deposit. These were important lode gold mines in Yuma. The mines were established in 1888 and mined until 1957 producing about 134,000 ounces of gold. The most active mining years were between 1891 and 1897. After 1897 mining was on and off for several years as new technology was invented to produce more gold. The surrounding areas of the mine also contain some gold. The Fortuna Mine was discovered in 1892 and has been one of the most profitable gold mines in Yuma County. The mine produced about 123,050 ounces of gold between 1896 and 1904. After which it was closed down. It was then reopened several times in 1913, 1926 and 1940 but not much was produced. When it closed down for the last time in 1959 it had produced about 125,332 ounces of gold. The Kofa Mountains are known in the gold mining circles for the rich North Star Lode Mine and the King of Arizona Mine. The North Star Lode mine was established in 1906 and was in active operation until 1911. The King of Arizona Mine was established in 1896 and remained in active operation until 1910. The deposited at the mine is also in form of silicified andesite breccia and quartz. There were attempts to reopen the mines in the 1930s but not much was produced within the time. By 1959 the two mines had produced over 200,000 ounces of gold. This is one of the most productive regions in the Laguna Mountains near the California border. The gold deposit in the area is in form of gold-quartz veins that runs deep into the mountains. Placer gold was first discovered in creeks in the area in the 1860s by Indian and Mexican miners who mined the area until mid-1870s. In 1884 dredging was done in the Laguna dam area but the flood of 1885 destroyed the dredges. Mining was also done in several surrounding areas on the gulches that feed into the Colorado River. Most of this gold was extremely fine textured but some miners were able to make it pay. By 1959 it is estimated the area had produced about 11,000 ounces of gold. These are important rivers that drain the western side of the Dome Rock Mountains. Gold was discovered in gulches along the rivers in 1862 by local Indians. Soon miners were all over the place trying their luck at finding some placer gold. Most of the rivers and creeks here are reported to contain some gold which is believed to have come as a result of the volcanic activity in the Dome Mountain. Lode gold was discovered near the rivers but was not as rich as the placer gold in the rivers. It is estimated that Arroyo La Paz and the surrounding drainages and tributaries produced about 100,000 ounces of gold by 1959. Southern Arizona is a popular area for gold prospecting. The mild winter climate attracts thousands of snowbirds every year who like to get out and hunt for gold in the desert. Since water can be hard to find in this part of the state even during the winter, the most popular tool for finding gold is the metal detector. Popular lightweight gold detectors including the Gold Bug Pro and Garrett AT Gold handle the desert ground very well and have proven themselves as reliable at finding gold nuggets. Flash floods can move a lot of dirt around, and it is surprising how much gold can be found in the so-called �mined out� areas around Yuma. Newly exposed bedrock can result in some nice gold being found in these areas even if they have been hunted hard in years past.